A Contrary View to "10 Kitchen Tools You Can't Live Without"
Long term readers of the L&TM5K will remember Phineas, one-time frequent commenter who even today stops by to dominate the occasional Wednesday Quiz. Among his other mad skillz, Phineas is a serious amateur chef, and has been keeping a, a -- what? a blog? a weekly newsletter? -- on fancy home cookin'. It's called Be a Better Cook - I'll Help -- Cooking Advice from a Passionate Home Cook. Much of what he writes goes a little over my head, frankly, since I am of simple peasant stock and prefer foods that can be prepared, consumed, and, if necessary, cleaned up after in less than a quarter of an hour. But it is well-written stuff, and is getting some critical acclaim out there, so I do recommend it for those of you burdened with sophisticated palates. Recently, though, he happened to write a post about something which I just happen to have a rare expertise in. It was called "10 Kitchen Tools You Can't Live Without." Now it so happens that, many years ago, I found myself marooned on an island -- Great Britain -- for the better part of a year, and was forced to assemble the kitchen tools that would see me through this time period. So I know, from cruel experience, exactly what Kitchen Tools You Can't Live Without. Let's take a look at the list that Phineas -- who, probably to protect his privacy, is calling himself "Tom McGuffey" on this new project -- came up with, and see how well he did. #1: A pot. This is very useful for heating up anything liquid, from boiling water for noodles to preparing a nice can of soup. It is also good for heating up refried beans -- now generally available in the UK, but at the time something I had to special-order by the case from a specialty shop -- or dahl, much more widely available in the UK than here. #2: A pan. This is good for frying things, such as eggs or pancakes. If you are doing fancy cookin', you can "saute" in it. #3: A spatula. A necessary companion for the pan. #4: A spoon. Useful for transferring liquid, runny, or granular foods to the mouth. Also useful for stirring things cooking in the pot. #5: A fork. Useful for transferring foods that need some kind of stabbing to the mouth. #6: A knife. In addition to a serrated knife capable of getting through a block of cheese, I also splurged on a table knife. This latter is a rarely used appliance, but it's generally considered part of a culturally appropriate trio with the fork and knife. #7: A bowl. Good for containing most foods made in the pot while consuming them. Not a strict necessity, as it is perfectly workable to eat out of the pot, but a nicety. #8: A plate. Much like the bowl, for foods made in the pan. Plates are more important than bowls, as pans can be difficult to eat out of. #9: A cup. For containing liquids, such as tea or water. This was eventually supplemented with some of the pint glasses that one can find for free in the neighborhoods around British "pubs," or bars, if one is out and about early on weekend mornings. So, we see that although Phineas didn't do a BAD job -- he realizes, for instance, that it's tough to run a kitchen without a pan, a pot, a knife, and some sort of way to grate your cheese -- he perhaps forgotten to think through the final stages of the dining process. As far as I can tell, he's going to be transferring food directly from the pot or pan to his mouth using either a chef's knife or a paring knife, which is not only inelegant, but raises significant safety concerns. He also includes on his list one item that I can not only live without, but that I can live without knowing what it is: a "Dutch Oven." I was initially baffled by "Microplane Grater" as well, but I'm thinking that's a cheese grater, and having a cheese grater on the list shows Phineas to be a man of good sense who will be able to deliver the nachos when the chips are down. Which is especially good for him, because with nachos you don't need a fork or spoon. #11: A blender. Used to make the banana/orange juice/fruit concoctions that one has for breakfast, and the carrot/orange juice/spinach concoctions that one sometimes has for lunch. #13: A baking sheet. Cookies! #14: A cooling rack. Cookies! Be a Better Cook - I'll Help -- recommended for you foodies out there! An online friend of mine writes a quirky and highly intelligent blog, updated almost daily. Though he is admittedly not a cook, except a weakness for baking I've discovered, he's been reading my weekly cooking advice newsletter for a while now. When my Top 10 Kitchen Tool issue came out a few weeks ago, he was inspired to write about the list, to a degree. I expected all kinds of debate and contradiction to ensue - "You don't need a peeler if you have a paring knife" - and that line of thought. Try peeling five pounds of potatoes with a paring knife - you'll know why I recommend the Kyocera Perfect Peeler. But I digress. This highly educated and eloquent blogger, who goes by the name Michael5000 and lives in Castle5000 in Portland with his wife, Mrs5000, an architect and artist....I'm continuing to digress. M5K's thesis can be summed up as "You forgot about dishes and silverware", then he adds other entertaining musings from a non-cook. You can read his rebuttal here, on his blog. Kindle readers - I'll publish it in the next post. By the way, in his blog The Life and Times of Michael 5000 he writes about nearly random and disparate subjects: film criticism, Bible review, quilting (yes, quilting), college football, literary criticism, postcard collecting and much more. I once was a finalist in his annual Dorkfest, which is what it sounds like - a dork contest. He's currently trying to win a game of online chess against someone from every country in the world (he's up to 50 countries, 21% of the world) and he started a vexilocriticism project - that would be critical analysis of the flags of the world. In my estimation, Michael5000 is more entertaining than TV, of which he owns not a one. I've already been cooking a bit for a big birthday party two days from now. Today the cooking is getting serious, and it does smell good in here. If you care to learn how incredibly deranged I am about cooking, you can review the menu 50th Birthday Party - Caribbean Theme. So this week I'm just going to share a quick recipe that's unique and downright simple. With warm weather already upon most of us,this recipe can be done on the grill or in the kitchen. Add some pasta (try this recipe from my website, Simple Pasta with Herbs) or rice, and you've got a complete meal. Trim ends of zucchini and slice into paper thin slices - 1/16 to 1/8 inch thick. They'll look like wide ribbons. If you have an adjustable blade slicer, such as a mandoline, this will take about 30 seconds. If not, try a cheese slicer. Last resort - very carefully slice with a large chef's knife. Trim one edge to make a long flat surface. Place flat end down on cutting board. Trim the skin from each side, then cut long slices down the length of the zucchini. Place zucchini strips into a large bowl. Cut each chicken breast crosswise into thirds. Season liberally with salt and pepper. If grilling, add oil to chicken. If sauteing, heat oil in skillet over medium-high heat. Add chicken and 7-8 minutes, turning only once or twice. Keep heat high enough to allow the chicken to brown. Remove chicken pieces and cut each in half and immediately place in bowl with zucchini. Gently toss together. Cover with foil. Note: if chicken is not cooked through fully, return to pan for another minute, placing cut side down. If grilling, add garlic and one tablespoon olive oil to a small pan, and place on a hot corner of the grill. Add garlic to pan keeping heat med-high. Stir for 1 min to soften garlic. Add wine and scrape bottom of pan to pick up any remaining browned chicken bits. Add water an continue to reduce. When liquid is reduced to about 1/4 C, pour sauce over chicken and zucchini. Heart healthy. Just chicken breast and zucchini with a few simple flavors and very little oil. Simple technique - a pan sauce made in this manner is surprisingly flavorful. Unique look of zucchini - the ribbons make for a dramatic presentation. Not cooking the zucchini - the heat from the chicken and small amount of sauce is all that's needed to wilt the zucchini. Raw or overcooked zucchini will kill a dish and this approach is easy and effective. This week we’ll explore a cooking show that sets a precise expectation. Rachel Ray’s 30 Minute Meals comes close to delivering on it’s promise – if you add a few more minutes. Expert Level Proficiency....Rachel’s been coking seriously for decades, and is expert with her knife skills. She can peel and dice a vegetable or trim meat, or separate chicken parts far faster than the average cook. But like all cooking shows, there are some real world aspects missing. It’s these things that allow Rachel to prepare that meal in 30 minutes but it will take us an hour. Other cooking shows are far less realistic, as they rarely prep all the ingredients during the show, they pre-cook portions of the meal and generally just summarize the cooking process. Most of us are not “expert level’…..We wash, peel and chop slower than Rachel. By the way, notice that all her vegetables are pre-washed? So even a little rinsing time is not part of her 30 minute window, giving her another edge over our actual cooking time. Boy was I wrong. Despite the simplicity of the seasoning, this dish develops rich, multilayered flavorings from the vegetables, with the starch from the potatoes combining with white wine to create the simple sauce. 1¼ to 1½ lb of fish fillets, such as salmon or cod. Fish should be cut into 4-5 pieces, approx. 1" thick at center. Place fish fillets atop the potatoes. Season with S&P then add the remaining white wine. Cover and cook for 6-8 minutes, 4-5 minutes if fish is less than 1" thick. I pride myself on not having any cooking "specialties" - I cook darn near anything. Everyday, ethnic, gourmet....as long as it's good food, with a fresh taste. But I've never cooked ribs. I was in Austin a few weeks ago with my longtime friend Mark who was visiting from Chicago, and we got to talking about cooking. He asked how I did my ribs and was incredulous when I told him that I don't cook ribs. He assumed that like many Midwestern and Southern rib experts, I was just unwilling to give out my secrets. But I really meant it. He still didn't believe me, so I texted Margie at home. She confirmed, "Tom doesn't cook ribs". And was a little annoyed that the party boys were bugging her while she was getting ready for bed. Here's the deal - I make home made barbecue sauce, I cook smoked brisket Texas style, I grill, I roast whole pork shoulders, I even made homemade Worchestershire sauce once to put into my homemade barbecue sauce (not worth the trouble). But I don't do ribs. Maybe it's because of all those people with their super-secret special recipes, sauces and techniques. Maybe I just didn't want to play that game. It's not that I don't like ribs. In fact, we all love them in my family. I just don't cook them. Cover the ribs with a homemade dry rub, wrap in plastic, chill for a few hours or overnight. Create a charcoal fire. slide coals to side to allow for indirect heating. Put some wet wood chips in foil, with a few air escape holes, and place over the hot coals. Add ribs, away from the colas. Cover. Be sure top and bottom vents are fully opened. Smoke like this for 60-90 minutes. Remove ribs from charcoal fire, wrap in aluminum foil. I moved to my gas grill for this step. Cook ribs over very low heat, away from grill element. For a gas grill, ribs were placed on the front two-thirds, and only the rear burner was on low. Heresy coming....you can do this in the oven if you want to. Cook at this low temp, (275-300 degrees) for a couple hours. Not having done this before, I was going to have to guess at the times. And the thickness of the ribs would make a difference too. Check ribs packets. When meat is very tender, almost falling off the bone, remove. Turn heat up to high on grill. Slather ribs with BBQ sauce and grill over high for 1-2 minutes. Well, I really liked the cooking technique. The meat was perfectly cooked, falling apart, juicy, flavorful. Since many rib portions vary in size, I'm not sure I can yet recommend a cooking time, but maybe with some experience I can settle on something more precise than "a few hours". But I didn't like my dry rub, the primary base of the seasoning. It's the one I use for brisket. I just didn't like it on ribs. Also, I didn't put enough BBQ sauce on them for the heat heat finish. So they didn't have that little crisp char. They did have a great blackened crust and smoky flavor from the first two cooking steps. That part was great. Because my ribs were "just OK", I'm not going to share the details of the recipe. However, the cooking technique above is pretty good. So the point of this little story is that I still don't really know how to cook ribs. If you feel like sending me your favorite technique, rub mix, sauce, etc - that is if you're willing to share your super-secret info - feel free to share. It will help me climb my rib learning curve. I didn't publish a recipe this week, because I was focused on kitchen tools. If you're starving for one, here's a quick salad I made last night, that got great reviews. Peel, core and cut each fruit into large, bite size chunks. Do the avocados last, to prevent browning. Chop or tear cilantro and add..
Add vinaigrette a tablespoon at a time until you like the taste.. Many cook books contain lists of what you must or should have in your kitchen. I'm resisting that temptation. Instead, here are just the 10 Most Important Cooking Tools. You should have each of these tools on hand, and each should be of pretty darn good quality. If you can't have them all at first (for example, as with my nephew Peter who is restocking a kitchen after being in the Marines), then this should be an important checklist for you. #1: Chef's Knife 8", or 7" for smaller hands. The most important item in the kitchen is a good, sharp knife, and a chef's knife is the foundation of all good cooking. While accumulating a few super-high-end, heirloom-quality chef's knives is an enjoyable past time, it's also expensive. I just have two - and old favorite, and an inexpensive one that I can travel with. That knife is from the Victorinox company (same company as Swiss Army knives) and is a top end PERFORMER, with a low end price tag. #2: Cutting Board....Plastic or wood cutting boards are both fine. Just avoid marble or glass which will dull your knives and cause them to slip. I like wooden board made from sustainable wood, which often are highly figured and thus uniquely attractive. Having a plastic cutting board to drop into the dishwasher is handy too, of course. A few different sizes are helpful, and it's important to separate raw products like chicken from raw vegetables and cooked foods to avoid bacterial contamination. #3: Peeler....specifically, the Kyocera Perfect Peeler. This innovative peeler has a ceramic blade that's razor sharp. This makes peeling MUCH faster and easier. The head swivels, so it can be used cutting to the left or to the right, or straight on like a U-shaped peeler. It goes right in the dishwasher, so it's the Perfect Peeler, isn't it? #4: 10" and 12" Non-stick Saute Pans....The jury is out on the health effects of non-stick surfaces, but to me everyone needs at least one non-stick fry/saute pan. Ever tried to make scrambled eggs in a non-non-stick pan? It takes A LOT of butter if want to try it. Calphalon provides a two-pan set which is a great value and has a lifetime warranty. If the non-stick surface fades away, Calpahon will replace the pan for you. (Just try not to think about WHERE the non-stick surface disappears to). #5: 8 Quart Stock Pot....This pot is a workhorse for everything from boiling pasta to making gumbo and chili, and can double as an oversized sauce pan if you're feeding a crowd. Though the price tag for a good stock pot is high, it will last a lifetime. #6 Largish sauce pan....3.5 or 4.5 Quart. I think every kitchen needs a 3.5 qt and a 4.5 quart saucepan - but if you have to pick just one to get started, go bigger. Later, add a 1.5 qt for small batches. The price tag on individual pans is no longer as attractive as it used to be, compared to buying a cookware set. Yet - you might need to just fill in a needed missing piece to complement what you already have. If you don't have a high quality sauce pan this size, you should consider one. #7: Paring Knife....3.5" Blade. About 90% of cutting can be done with a chef's knife. But there are times you need a paring knife. Cutting eyes out of potatoes, coring strawberries, etc. Also, those of you with smaller hands might need a smaller knife from time to time. #8: Strainer / Colander....Tough call - is it that important to have a good one? Well, I've replaced several cheap-o colanders and strainers over the years. Then I splurged on a stainless steel All-Clad colander. It will last a lifetime and a thing of beauty. It's shiny, it's heavy, it works. It looks brand new after 9 years. What more could you want? #9: Microplane Grater.... One of the great innovations in the past decade or so, razor sharp edges on a microplane make grating cheese or vegetables a snap. Be careful of cuts while you're grating - this tool is very sharp. I like these graters in stainless steel, with a sturdy handle, and this version cleans up easily. #10 Dutch Oven.....You could live for a while with just a stock pot and not a Dutch oven, or the other way around. But once you get hold of one of these you'll be quick to keep making stew, soup, braised meats, chili and gumbo. This hefty cast iron pot is covered with attractive enamel in almost any color you desire. The pot can go straight from stove top to oven. 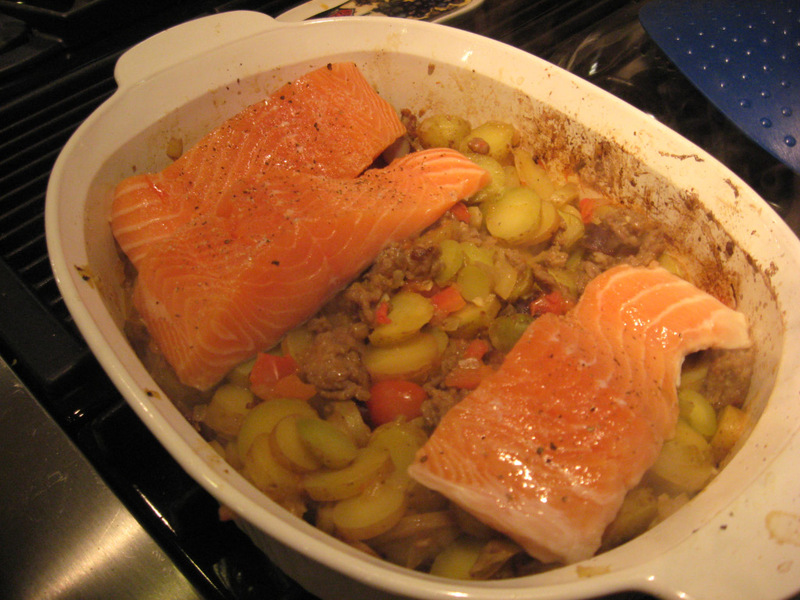 With few exceptions (driven by you and your cooking) a Dutch oven also cleans up easily. Le Crueset calls their product a French Oven, because, well, they're a French company, and they're all....French about it. It's the same thing as s Dutch over though, and Le Crueset makes the best around.